Global video shoot for Gray Line Worldwide over 21 days last October-November. > Style: Sleek enough to avoid sticking out at a five star hotel, yet outdoorsy enough to work for a ski weekend, the Ozone 22” has clean lines and smart design. But don’t expect bells and whistles. The bag draws little attention and the light grey color scheme allows for quick identification when traveling with other baggage. As I described to a friend, it made me look less dirtbaggish. > Size: For our trip, the goal was to check only two bags between the four of us, so everything else had to be carried on. 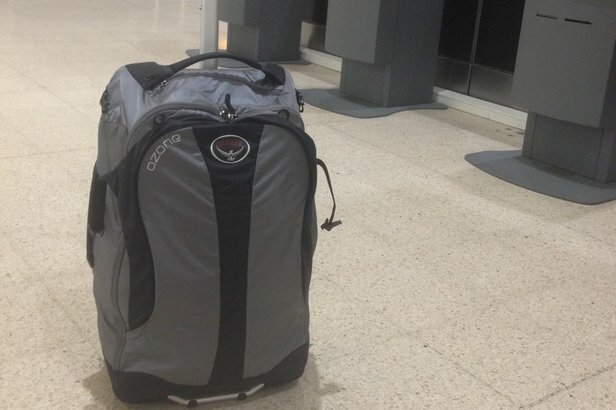 I also needed a bag that would meet Europe and Asia’s small carry-on standards. Only once in Casablanca did the bag not pass this test—the wheels wouldn’t smash down into the sizing box. However, after some negotiation and help from the team, I was able to push it through security without being caught. > Compartments: The carry-on is essentially one large compartment with a small top pocket and back sleeve meant for a laptop, magazine or books. (I wouldn’t trust the sleeve for a laptop, though as it’s exposed and could easily be crushed.) The main compartment is accessible by a full-length zipper and is easy to get in and out of in a pinch. Store small things you will need to grab quickly in the top compartment, which is fairly deep, and use the internal mesh stash for whatever you want to keep separate from the main compartment. Make note, however, that there is not an expandable zipper so pack and plan accordingly. > Bottomline: At $229.95 it’s not cheap, but after 40,000+ miles and 15 back-to-back flights this bag has become my go-to carry-on from here on out. I’ve already used it six times since and haven’t been disappointed yet. The size is a bit smaller than some carry-ons, but with airlines cracking down and people shaming each other for big bags on Twitter, the bag has plenty of space for a weekend trip, sans the ski gear of course. Our on-snow test of the Patagonia women's Snowbelle Jacket.